Arrow Sudoku puzzles are an enjoyable sudoku variant that is rarely seen in print. In addition to the arrows, it will immediately be noticed there are many less givens than with a standard sudoku puzzle. But this is compensated by the fact that the arrows provide additional information - if you know how to access that information! The circle at the top of each arrow contains a number that is the sum of the numbers that appear along the body of the arrow, ending in the square with the arrow head. Thus if you look at the first circle in cell two of the puzzle, the number therein is the sum of the first and eleventh cells of the grid, so if those two cells contain 6 and 3, then the circled cell contains 9, as the sum of 6 + 3 = 9. Arrows provide lots of information that helps you to solve the puzzle. At the most basic level, you know that the circled cell cannot contain the 1, and each cell along the path of the arrow cannot contain 9. Whilst this may not seem like much, it can lead to placements straight away! Look at the sample puzzle to the right again. Ask yourself where the 9 can be placed in the bottom row. It may not be immediately obvious, but it can be placed outright. It can't be in cells 4 - 6 of the bottom row because there is already a 9 in that box. And as it turns out, cells 2, 3, 7, 8, 9 in the bottom row are all along the path of an arrow, and therefore cannot contain 9. This only leaves the first cell in the row - containing a circled cell - that can hold 9, so it can be placed immediately! By working out the possible values of numbers along the path of an arrow and at the head, you can quickly whittle down the options for cells in the grid and start solving. It just may take a little while to build up momentum. Look now at the arrow region whose head is the second cell in row 6 (to the right of the given '2'). Note that the body of the arrow goes through 5 cells, and that three of them are in the same region. Since the three cells are in the same region, then the lowest total for them is 1 + 2 + 3 = 6, whilst there are two cells in other regions, so the lowest for those is 1; thus the circled cell contains either 8 or 9, with all other values instantly eliminated. Furthermore, the cells at the start and end of the arrow can contain only 1 or 2, and the three in the middle can only contain 1,2,3,4. By working through each arrow in this way, together with the standard solving rules, you can reduce the options without any guesswork, and start to place numbers - which will then give you more information to feed-in to the arrows, and you can work interactively back and forth between the information the arrows give you and the standard sudoku rules until the puzzle is complete. 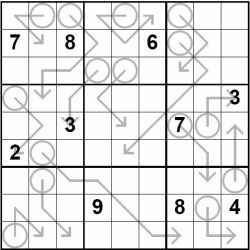 Each arrow sudoku - or sudokarrow - has one solution that can always be reached without guesswork, so if you get stuck, stay patient and look for any deductions you may be missing... good luck! I am addicted to these Sudokarrow puzzles but as you quite correctly suggest, have only found them in the i on Saturday. Is there a book? can I buy online? I came looking for help as I spent most of Sunday trying to complete the puzzle and failed. Thank you for the tips. I shall not be beaten. I find the i sudukoarrow puzzles hard and pretty much always fail! How would you rate them? Hi Jane, thanks for the message. The sudokuarrow puzzles are definitely harder than standard sudokus and will take longer to solve. The key is often to work out the possible values along the arrows as per the tips above. Generally speaking you'll have a large number at the top of an arrow and small values along the path of the arrow. How much of the puzzles do you solve before getting stuck... do you get a fair way through or is it right at the beginning. Have any of the tips on the body of this page proved useful? These puzzles are so addictive. I still haven't solved one completely, but feel that getting through even half is an achievement. Thank goodness they're not in the i (a great newspaper!) every day. I'd never get anything else done! Your solving tips are good, although I'd worked those out for myself, and still haven't finished one! These had been beating me for months, but I looked forward to every Saturday for the chance to try again! I've cracked 2 of them now, in the same weekend. I was so excited after doing the first one, I dug last week's paper out of the recycling bin to try it! My method was to create a larger sudoku grid in Word, and in very small light type at the top of each box, put the numbers 1-9 (so they fit in one row, evenly spaced out). Then I re-drew the circles and arrows and given numbers in pen. Then I used the process of elimination and (in pencil!) colour over the numbers as you decide they're not a possibility. No circle can be 1, and nothing in the path of an arrow can be 9. If there are more than 2 boxes in the path of the arrow, then none of those boxes can be 8. If there are 3 boxes in the path of the arrow and they are all in the same row, column, or square, the number in the circle must be more than 6. And of course you use the numbers you've been given and cross them out in all the other boxes in the same square, column, or row. There is a point at which it suddenly starts to go faster and you know you're going to get through it--an elusive feeling I'd been chasing for months!! I have outed myself as a complete and utter nerd. I'll get my coat. I've finished off the 2 issues of Arrow Sudoku Magazine. Any chance of some more being produced please? These are fiendish! I have sometimes found help from the following. Where three numbers which are all different add to a circle, there are only seven combinations, adding to between 6 and 9. All but one of them contain '1'. Hi Neil Thanks for the comment - we'll try and get a new collection created as soon as we can! There's also a book of Arrow Sudoku which I don't think is mentioned elsewhere on this post, available via the Arrow Sudoku Book page here, on Amazon. The Sudokarrow puzzles in the Saturday "i" are very good - never easy; if I get stuck I copy it to a large sheet of paper. Unfortunately this did not work with the one that published on July 19th 2014. It's the only one in "i" I've failed to solve, but have not given up! Hi Jim Thanks very much - glad you enjoy the sudokuarrow puzzles. Hope you've managed to solve the puzzle you mention by now - if not just contact us directly and we'll send you the solution. Well i feel much better having read the above comments,I too, find Sudokarrow quite challenging.I am pleased to say that I have solved some but it has taken me a few days! !